Julia has over 10 years of clinical experience working in the outpatient orthopedic setting with patients of all ages and skill levels. She has gained strong knowledge in treating post-surgical patients, including complicated cases. She enjoys using her additional knowledge in strength and conditioning to treat athletes of all ages and help patients adapt their independent strength and conditioning programs created in the physical therapy gym to their individual gyms. 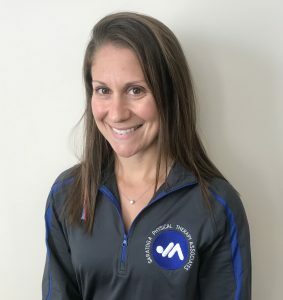 Julia has attended continuing education courses ranging from manual therapy techniques to rehabilitation of the athlete to the latest trends in surgical care. Her objective is to educate each patient with a complete understanding of his or her injury and/or diagnosis. Julia likes to work with her patients to create comfortable, effective, and individualized treatment programs and home exercise programs with the goal of returning all patients to their highest level of function.